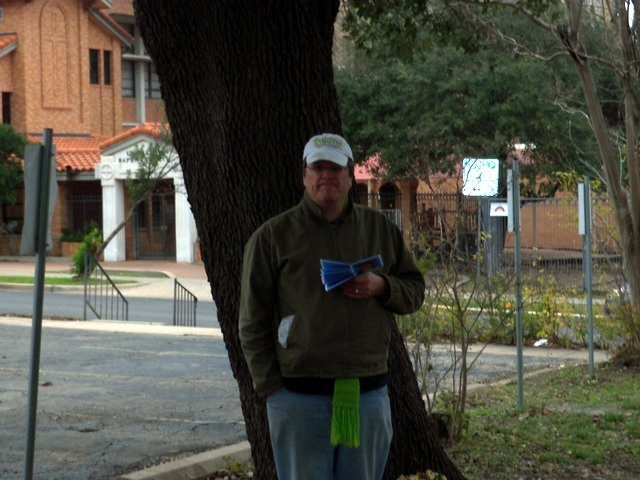 A street-dependent client ran up to me recently on the street. He's made himself unwelcome pretty much everywhere, but SYM continues to serve him because he's reaching that special age between 24 and 28 where he might turn his life around. He ran up to me with a gleam in his eye I've never seen in the three years of working with him. He said, "Terry, last night I reached the end. I gave all the bad stuff in my life over to Jesus." He's been difficult and hard to handle, but it's all been worth it! What makes me a hard path when it comes to letting faith take hold in my life? What makes me shallow ground so that my faith withers? What makes me a briar patch so that my faith cannot be shared with others? What does the parable of the sower tell us about how to be good ground where faith grows and is shared? o Don't resist… if something make you feel wrong, do something about it. This lesson was possible because someone sacrificially provided sandwiches over which these important discussions take place. Won't you consider making a difference by checking out volunteer.StreetYouthMinistry.org? This poem was shared with me to share with readers. It's from a 22 year old girl who lives and sleeps on the street. A line in that world. Moving from stone to stone. They land on someone’s shoulder. They turn and see you. Maybe they have loved you. But they will always turn away. 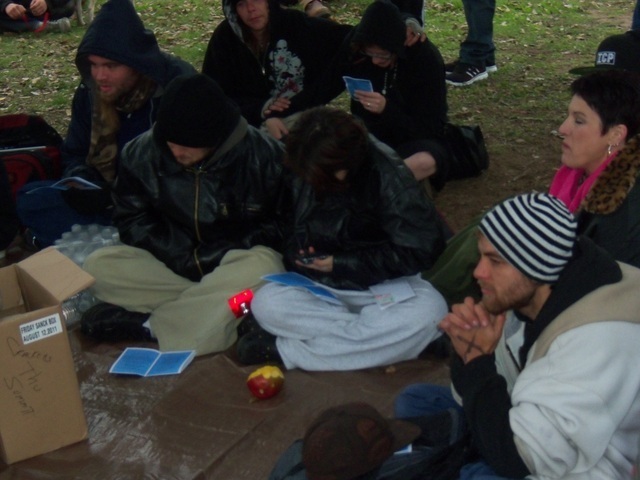 I was recently asked the a street youth what my ministry needs most right now to help out. I replied without hesitation that we need more food volunteers to make food for our Monday, Tuesday and Friday events. Volunteers have dried up for reasons unknown since Christmas. Help us fill our calendar again at volunteer.StreetYouthMinistry.org. Like the great man that we as a nation pause to honor today, I have a dream, but before I share it, I’d like to take you back a just over 40 years. In second grade, I came across the word “cancer” in my “Weekly Reader.” I didn’t know that word. When I asked, the teacher said, “Shhh…. It means someone is dying. We don’t talk about it.” Today, we have a different reaction to cancer. We ask, “Oh… what type? what stage? Is it operable? Will there be chemo? radiation?” We ask, “What type of support do they have? How can I help?” We ask, “How about their family? Do they have a support group?” Cancer is no longer a hushed-up word to avoid. We dissect it and talk of survival rates, of multiple bouts and battles, and of winning. 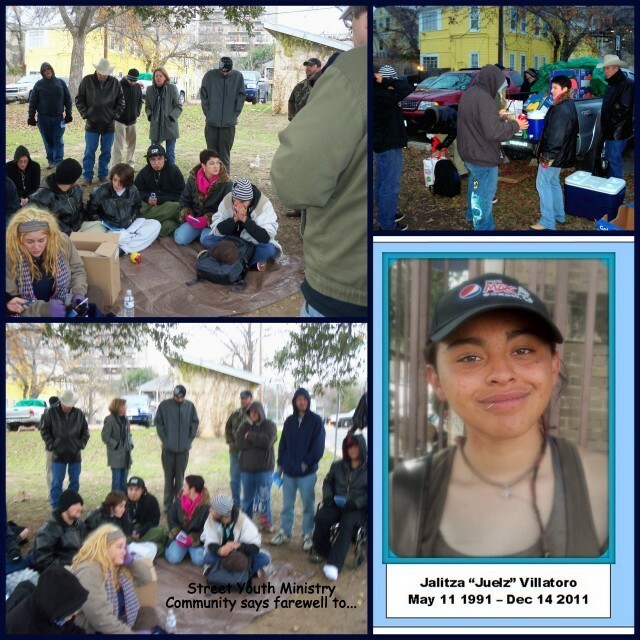 My passion lies with helping young homeless people in Austin. 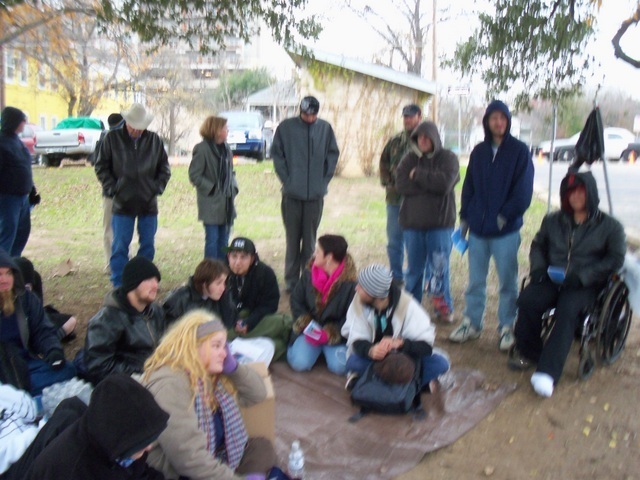 Homeless people come in all age groups, including high school and college. Young indigents have been hanging-out on the edge of the UT Campus for more than 50 years, and they’re still coming. Each week I see about 10 new faces, an average of about 80 individuals per week. That’s more than 1500 in the past three years, the vast majority 17 to 26 years old. There are as many paths to the street as there are individuals, but about half were in foster care. Four of ten have mental health issues. One in four are women. Almost all have been abused. Many, but not all, overuse alcohol or drugs or both. 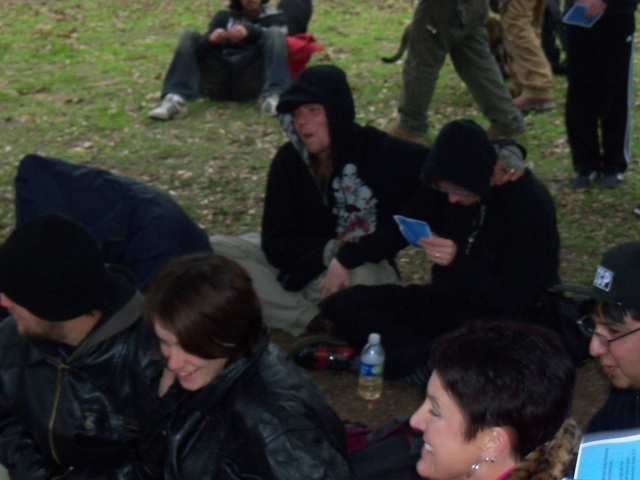 Most street youth were churched in one form or another as children. And most have concluded that church and Christians are judgemental, hypocritical, and simply not relevant to their lives. They have nailed the church doors shut. Street Youth Ministry seeks to change that. We offer Christian services every day. We meet street youth non-judgementally, transparently, and on their own terms. Partner churches open facilities to us. Volunteers prepare and serve meals, sit at tables with them, pray with them and simply talk. Donors gather things so we can provide for some of their needs. We make referrals to local agencies, shelter, and partner social workers who help them access limited but complex help available in our community. Our role in the midst of this care is to bring the the abundant love and grace of Jesus Christ every time and every day. And street youth have responded. They have shown they are hungry to be treated this way and for meaning and significance in their lives. One late afternoon, I prayed in an alley with the self-confessed angry alcoholic. “Lord, you made this precious child. He’s hurting and doesn’t know what to do. Help him to lay these troubles at your feet and, together, you and he can begin to deal with them.” Tears rolled down his cheeks and onto our joined hands. During the counseling that followed, he imagined tearing away the dark tarball that surrounds his heart and keeps him numb. He allowed himself feel for the first time in years and imagined a future where he helps people like himself. We closed in prayer, “Lord, this is but one step of many. Help this young man to turn past pain into strength. Help him to find his path to recovery and be able to help many others.” He left with new found hope. 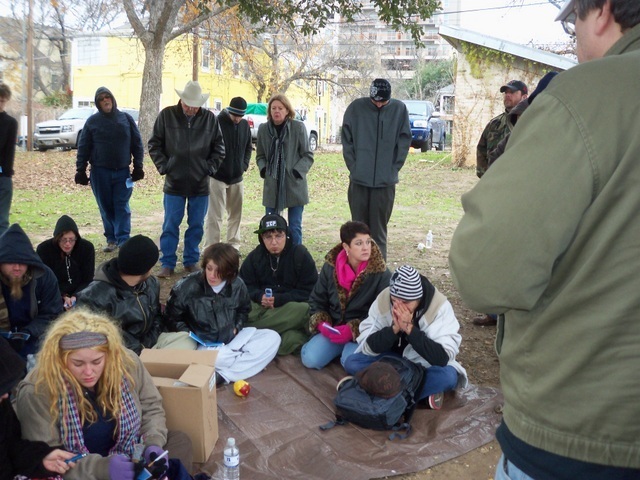 When it’s too cold to sleep outside in Austin, we go out and help the youth figure out their options: “Do you have the right gear to survive the night? Can you call a friend to sleep on a couch? Can you go to a shelter?” We give out warm clothing, we serve hot cocoa and food, but the most important thing we do is to stand with them. We see them, meet them, and treat them with love, respect, and grace in a time a great difficulty. Back to my dream. In it there is no outcast. There is no more throw-away young people. No more do we walk by silently. No more… “Sh! She’s a street kid. Such a waste.” We will talk of homelessness like we do today about cancer… churches will lead the charge to ask “What kinds of challenges and set-backs?” “What kind of abuse, neglect, addiction, developmental issues?” What kind of help and support are needed?” “For how long?” “What can we do?” Yes… I have a dream. And I know that God is taking action in that dream. And the future will be different. One day we will frequently talk of winning, of preventing, and of finding stability for those who are homeless. 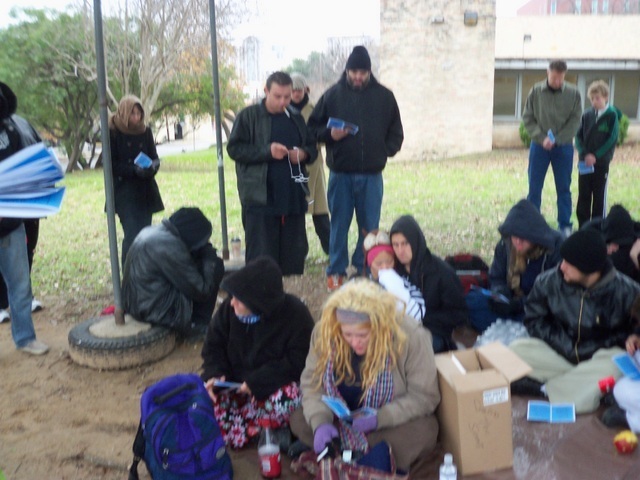 Every Christian will know the blessing of personally caring for the poor and homeless in our neighborhoods and city. We will gratefully claim Jesus’ statement, “You will always have the poor.” We will understand He wasn’t making a scientific statement about our inability to find a fix. He wasn’t indicting the poor as hopeless. Our incarnate Lord, who has prepared everything good for us, was promising something of great value… that even as some have much and some have little, we are a blessing to one another. Our lives will be richer because we love and share and care for one each other as neighbors. I invite you to get involved. We need people who provide food: sandwiches, snacks, and breakfast tacos. We need people who provide stuff: socks, coats, sleeping bags, blankets, dog leashes and collars. We need people who come be with our clients, helping to make them feel comfortable and loved. We need people who give money so we can focus even more on Christian ministry and less on fund raising. We don’t ask you to do everything, but we do ask you to do something. Won’t you consider our invitation? There’s more information at volunteer.StreetYouthMinistry.org. You will be blessed. I promise. Choosing the songs for this memorial was hard because Juelz had such a wide variety of friends. Different groups of people all claimed Juelz as their own, including wanting to choose iconic music from their experience with her. However, in a gathering of about 20 of her friends, everyone agreed on this particular song. It’s a difficult song, a cover of “Let it Be” by the Beatles. The group was insistent that it be the version of Let it Be from Across the Universe. The song is the soundtrack for the scene where the boy is shot and the mother is told. The funeral march ensues. It’s very beautiful. We played that song. Some sang along. Many sobbed uncontrollably. Then I read Hebrews 4:15-16: “For we do not have a high priest who is unable to sympathize with our weaknesses, but we have one who has been tempted in every way, just as we are–yet was without sin. Let us then approach the throne of grace with confidence, so that we may receive mercy and find grace to help us in our time of need.” I explained that Juelz had first told me that she didn’t believe in God. But she kept coming, and it was clear from her comments that she did believe. One day, she explained that she couldn’t talk to God. She had lost her ability to pray, and that really disturbed her. She kept coming and kept hanging around. And it is my joy to report that Juelz found her words again. She reported in letters to many friends that she was once again able to pray to God and had renewed her relationship with God. She was so happy about that and shared the news with her friends. What I take from this, today, is that to give to this child gold and frankincense, they were aware that this child was to be their king. To give this child myrrh, they were aware that their king would die. They did in that day, and we do on this day, mourn the loss of this king. We do, however, choose to celebrate his life. Today we are missing one of our wisdoms. Together, we finished the memorial by celebrated what Juelz believed… her amazing sweet spirit, her view of God, her view of life. Many there directly shared about addiction pand romised not to let Juelz’s death be in vain. Her life certainly wasn’t lived in vain, but her death seemed senseless to many there. Many promised to make sure it would serve as a wake-up call and warning. Many promised to work harder to help friends turn the corner of addiction. We closed in prayer that Jesus receive Juelz’s soul and that there be a big celebration in heaven. 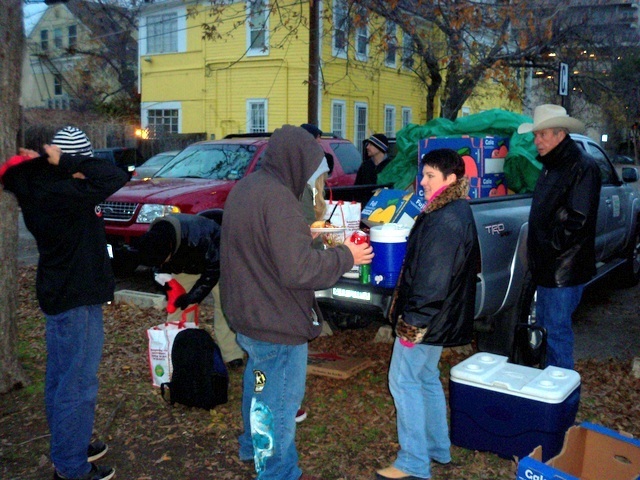 Following the service, volunteers served lasagna and a hot meal to the very cold crowd. Many kept listening to the music selections over and over. A small shrine began to be assembled around the flower. One girl left her necklace with a buffalo charm because “Juelz was a strong as a buffalo.” Several left notes or drawing for Juelz. We distributed clothing, dog food, toiletries and other goodies. And because it was almost Christmas Eve, we also distributed Christmas stockings and Christmas Bags of Grace, filled with candy, hats and gloves, flashlights, fruit, and a Bags of Grace. It may be our last memorial on that property for some time, not because I suppose that no one further will die in the coming days, but because the property is to be used as the construction office for a high rise residential unit being built next door.